The important thing is not who or how but that Arthur Goldberg is being held accountable for promoting conversion therapy pseudoscience. Last December, based primarily on an analysis of their 2016 tax return, I questioned whether Arthur Goldberg was back in the conversion therapy business in defiance of a New Jersey court order. Has Jewish gay conversion therapy returned to New Jersey? It looked like Goldberg simply converted one nonprofit organization into another. I referred the matter to Heidi Beirich at the SPLC. Perhaps the most ironic part of this is that Ryan T. Anderson is partially responsible for my curiosity. Anderson is the editor of Witherspoon Institute's blog; Public Discourse. (Witherspoon Institute is a far-right organization headed by an Opus Dei numerary.) Anderson published a piece by Arthur Goldberg as president of Jewish Institute for Global Awareness. 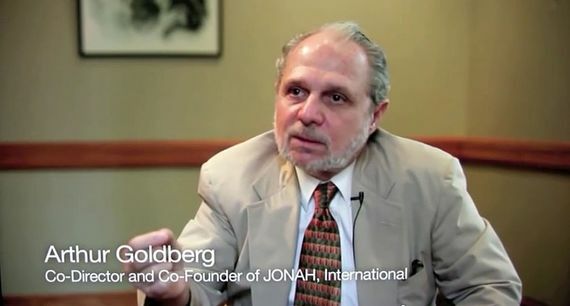 Goldberg is a convicted felon and swindler so anything he posts creates suspiArthur Abba Goldberg, Gay Conversion Therapy, Jewish Institute for Global Awareness, JONAH, Southern Poverty Law Centercion. In a separate action, I filed a complaint with the Securities and Exchange Commission because it appeared as if Goldberg was violating his lifetime ban on being an investment adviser. JIFGA's phone number, previously Jonah's phone number, is also the phone number of Alfus Financial Services. I do not know whether or not the gonif (Yiddish, roughly horse thief) has any money. However, under the terms of the original injunction, a violation means that he would owe the SPLC a pile of money in legal fees.